Needless to say, referring to "Pope Francis" is going to take some getting used to – and given the Holy See's style in statements, the new flood of lead-in references to "The Holy Father Francis" has suddenly made the Vatican sound more like an OFM house. Some shift, that. And even 24 hours in, it's just one of many. Even before Election Night ended, the stories of a starkly different style for the 266th pontiff started streaming out: Papa Bergoglio's decision in the Sistine Chapel to shirk the elevated papal throne and stand at ground level to receive the traditional "obedience" of the cardinals, then ditch the Pope's motorcade and ride back to the Domus as he came – with the cardinals on the bus (above left, repeating the exercise before tonight's Mass). And then there was this morning. The papal Mercedes – waiting again, this time to take Francis on his intended visit to St Mary Major – was again left behind in favor of a stock Volkswagen. And on the way back to his new home – which Boston's Capuchin Cardinal Seán O'Malley compared to "being a prisoner in a museum" – the Pope called for a detour to the Domus Paulus VI, the clergy lodging across the Tiber that was his pre-Conclave hotel, to collect his things, check out and pay the bill himself (below). 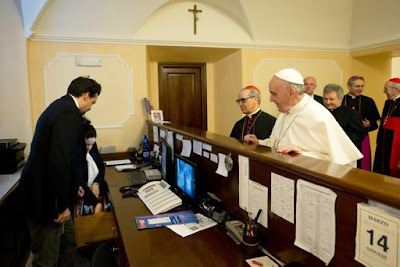 As the afternoon press briefing noted, Francis wanted to "set an example" by personally running the errand and settling the tab with his own money. Along the way, the bishops of Argentina received a message from their countryman-Pope, communicated through the Nunciature in Buenos Aires. In the three-sentence memo, obtained by Whispers, Archbishop Emil Tscherrig wrote that Francis wanted to convey his "sentiments of gratitude" for their prayers and expressions of care for him. The next sentence, however, was the kicker – repeating the call then-Archbishop Bergoglio made on receiving the red hat in 2001, the nuncio said that the Pope "would like that, instead of going to Rome for the inauguration of his pontificate" on Tuesday, the prelates express "their spiritual closeness [to Francis]... by accompanying the neediest with an act of charity." Full as the day's been, however, one key order of business was notably left undone. 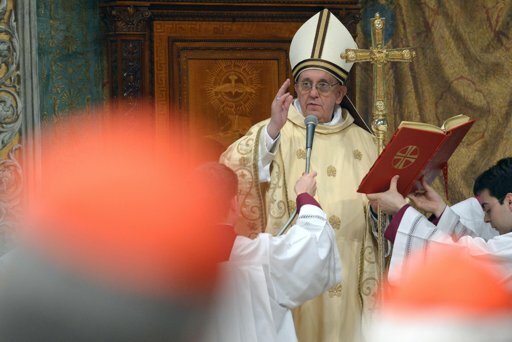 As the heads of the dicasteries of the Roman Curia all lost their posts at the sede vacante, the group of prefects and presidents must be reconfirmed by the new pontiff for the governance of the church to be resumed. 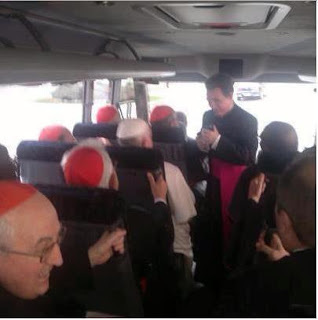 Then again, considering the in-house storm that preceded the Conclave, perhaps there's an explanation for the delay – namely, that Francis' sudden turn-up at the check-in counter won't be the biggest of his early surprises. While tonight's Sistine Mass was solely with the cardinal-electors, the Pope will meet with the entire College tomorrow morning in the Sala Clementina of the Apostolic Palace – the same room where, two weeks ago today, Benedict XVI farewelled the body by pledging his "unconditional reverence and obedience" to the one among them who'd become his successor. "Qui Sibi Nomen Imposuit Franciscum"